Eight years into its existence, CMS’ Center for Medicare and Medicaid Innovation has recommended further development of only two of the 37 models the center has created, with testing completed on 10 of them, according to a new report by the U.S. Government Accountability Office. The Affordable Care Act set aside $10 billion for the Innovation Center’s activities for fiscal 2011 through 2019 and $10 billion per decade beginning in fiscal 2020. By Sept. 30, 2016, the last period for which data are available, $5.6 billion of its initial $10 billion appropriation had been spent…. The report is silent as to what fault the agency found with the other 35 models. Generally, to be candidates for continuation models must produce savings and maintain or improve quality of care. The Innovation Center also plays a critical role in implementing the Quality Payment Program, which Congress created as part of the Medicare Access and CHIP Reauthorization Act of 2015 (MACRA) to replace Medicare’s Sustainable Growth Rate formula to pay for physicians’ and other providers’ services. In this new program, clinicians may earn incentive payments by participating to a sufficient extent in Advanced Alternative Payment Models (APMs). In Advanced APMs clinicians accept some risk for their patients’ quality and cost outcomes and meet other specified criteria. The Innovation Center is working in consultation with clinicians to increase the number and variety of models (PDF) available to ensure that a wide range of clinicians, including those in small practices and rural areas, have the option to participate. An APM is a payment approach, developed in partnership with the clinician community, that provides added incentives to deliver high-quality and cost-efficient care. APMs can apply to a specific clinical condition, a care episode, or a population. This is a broad definition of an APM…. All APMs and payment reforms that seek to deliver better care at lower cost share a common pathway for success: providers, payers, and others in the health care system must make fundamental changes in their day-to-day operations that improve quality and reduce the cost of health care. Making operational changes will be viable and attractive only if new APMs and payment reforms are broadly adopted by a critical mass of payers. When health care providers encounter new payment strategies for one payer but not others, the incentive to change is weak. When payers align their efforts, the incentive to change is stronger, and the obstacles to change are reduced. The agency that runs Medicare and Medicaid on Tuesday established a new center it says will drive ideas on how to improve patient care in and out of hospitals, while streamlining payment systems. CMS Administrator Donald Berwick said on Tuesday new models for care delivery and payments will help drive down costs across the health care system. Berwick — who has been a source of controversy for comments made in favor of the British publicly funded health system — on Wednesday will try to sell lawmakers on the virtues of the new innovation center and other Medicare reforms when he testifies in front of the Senate Finance Committee. Medicare reform is a main plank in the health reform legislation championed by President Barack Obama. “I think everyone’s really interested in getting better efficiency in the system,” said Amy Thornton, a health policy analyst who follows CMS for Washington Research Group. Touting $380 million in savings from the Affordable Care Act’s first test of accountable care, Medicare says the pilot did well enough to expand. But it’s unclear how the participants got the savings and to what extent others can replicate the success. 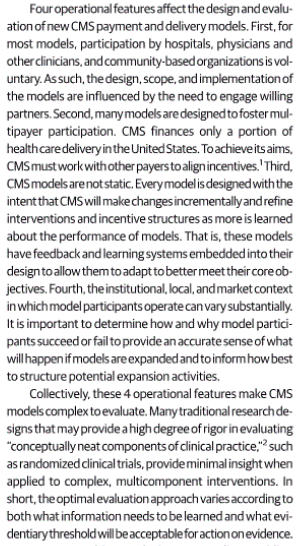 Dr. Patrick Conway, head of the CMS Innovation Center, and his colleagues announced the savings this week in JAMA. They detailed medical spending for Medicare patients who received care from 32 accountable care organizations during the first two years of the Innovation Center’s Pioneer ACO program. The ACO “treatment” under investigation is not a prescribed set of activities or interventions. Rather, it is a financial arrangement in which provider organizations attempt to reduce expenditures below a set target while maintaining high quality metrics in exchange for bearing risk for reducing expenditures. It’s hard to imagine a definition more devoid of meaning. Let’s begin with the lead noun, “arrangement.” Is it possible to choose a more abstract word? What does it mean to say “provider organizations” are “in an arrangement” and, once in, they “attempt to reduce expenditures while maintaining high quality metrics”? How do they “attempt”? We don’t know. We don’t know because ACO proponents have never set forth a “prescribed set of activities or interventions,” as L&M put it so precisely. The refusal of ACO proponents to state clearly what it is ACOs are supposed to do means ACOs are under no obligation to employ any particular intervention, to hire any particular type of staff, to follow any particular protocol, or to focus on any particular type of patient. And that in turn means contractors such as L&M, researchers such as Dr. Guterman, and reporters such as Melanie Evans (the author of the Modern Healthcare article) can’t make any sense of the outcomes of the Pioneer [ACO] program. “CMS models are not static” is, I think, another way of saying that the results of CMS model testing cannot be replicated. At which point, one might ask, why are we even running these studies? Why don’t we look sixty miles north of Burlington, Vermont and hire some Canadians to tell us what to do? I think you know the answer to that question. • Pioneer ACO. Pioneer ACO tested an ACO delivery and payment approach that gave providers an opportunity to be paid a relatively greater share of savings generated, compared to participants in other ACO models, in exchange for accepting financial responsibility for any losses. In year 3 of the model, ACOs that met certain levels of savings in the first two years could elect to receive a portion of their Medicare fee-for-service payments in the form of predetermined, per beneficiary per month payments. • YMCA of the USA Diabetes Prevention Program (Diabetes Prevention Program). The Diabetes Prevention Program applied a lifestyle change program recognized by the Centers for Disease Control and Prevention to reduce to the risk of Type 2 diabetes for atrisk Medicare beneficiaries. The Diabetes Prevention Program was a part of the Health Care Innovation Awards Round One model. Goal 2: Identify, test, and improve payment and service delivery models. This goal has one performance measure, which identifies the number of models that currently indicate (1) cost savings while maintaining or improving quality or (2) improving quality while maintaining or reducing cost. As of September 30, 2016, the Innovation Center reported that four [of 37] section 1115A model tests have met these criteria (see table 4). Goal 3: Accelerate the spread of successful practices and models. For this goal, the first performance measure focuses on the number of states developing and implementing a health system transformation and payment reform plan. The second measure focuses on increasing the percentage of active model participants who are involved in Innovation Center or related learning activities. As shown in table 5, the Innovation Center reported meeting its target for the first measure for both fiscal years 2015 and 2016, but not meeting its target for the second measure. Looking forward, officials told us that the Innovation Center has developed a methodology to estimate a forecasted return on investment for the model portfolio, and is in the early stages of refining the methodology and applying it broadly across the portfolio in 2018. As part of the development efforts, the Innovation Center expects to utilize standard investment measures used in the public and private sectors. Whatever that means. Since we don’t know what a model is, what on earth is the use of creating a portfolio of them? While it is undeniable that neoliberals routinely disparage the state, both back then and now, it does not follow that they are politically libertarian or, as David Harvey would have it, that they are implacably opposed to state interventions in the economy and society. Harvey’s error is distressing, since even Antonio Gramsci understood this: “Moreover, laissez-faire liberalism, too, must be introduced by law, through the intervention of political power: it is an act of will, not the spontaneous, automatic expression of economic facts.” From the 1940s onward, the distinguishing characteristic of neoliberal doctrines and practice is that they embrace this prospect of repurposing the strong state to impose their vision of a society properly open to the dominance of the market as they conceive it. You will note that this is exactly what the Innovation Center is doing. And you will note the results after a decade and $5 billion dollars of spending: 35 of its 37 exercises of state power turned out to be meritless, and of the remaining two, one (ACOs) is both intellectually suspect and — if one is the suspicious sort — the horse that was picked to win anyhow. This is a terrible track record. It may be that there are areas of human endeavor — one thinks of the military, the church, the family, teaching, “the communism of everyday life,” as I believe Graeber puts it — where the market is either not present at all or doesn’t dominate. When one looks at the exceptionally bad results of our health care system, at least if “health” “care” be the standard for judging, it’s hard to believe that health care, which is, at its heart, a social relation between patient and caregivers (doctors, nurses, etc.) is not one such area. Neoliberal drunks are looking for their keys to health care under the lamp-post of the marketplace (“the streetlight effect“), and they’re not doing very well, are they? Perhaps they should be led gently away, and we should, as I’ve said, simply ask the Canadians to tell us what to do. Why not learn from success? See Berwick’s speech to the NHS here. For example: “[P]lease don’t put your faith in market forces. It is a popular idea: that Adam Smith’s invisible hand would do a better job of designing care than leaders with plans can do. I do not agree. I find little evidence anywhere that market forces, bluntly used, that is, just consumer choice among an array of products with competitors’ fighting it out, leads to the health care system that you want and need.” Oh, and awful reporting by Reuters; Britain’s NHS isn’t a “publicly funded” health care system, like Canadian single payer. Rather, British medical personnel are — or were, until the Tories began sawing across the NHS’s windpipe with a dull knife — public servants, employed by the government. #MedicareForAll advocates are, by world standards, centrist. According to officials, when results fall short of targets, they examine the causes and make appropriate adjustments to the program [so there’s no baseline]. Officials stated that the missed target was driven by the high growth in the number of ACOs that were new—and therefore would not yet be expected [expecte why and by whom?] to achieve a level of savings in which they could share—and not by ACO performance deficits [except the savings are the metric for performance, so no]. As a result, officials decided that no adjustments were required to the Medicare Shared Savings Program or other ACO Models to help improve performance. However, as shown in table 3, the Innovation Center set a target for 2016 that was lower than the 2015 target [lowering the bar!]. For 2017, the Innovation Center lowered the expectation for growth compared to previous years, setting a target that was 1 percent higher than the 2016 target. Moving forward, CMS believes [cf. 2 Corinthians 5:7] that as more ACOs gain experience, more will share in savings [let us know how that works out]. This entry was posted in Free markets and their discontents, Guest Post, Health care on April 29, 2018 by Lambert Strether. Don’t get me started on Obamacare. Just don’t. My difficulty with them stems from the un-usability of their website. I’ve had a great deal of difficulty logging into it, and then, taking care of necessary business like setting up monthly autopays for my premium. Their phone support, when I’ve been able to get through to it, is clueless at best. All this was ever about was clouding the issue of whether “markets” can ever deliver health care. Until everyone is born at age 35 with a proper education and money, they can’t. Well, this CMS is serving one big unacknowledged purpose. It is successfully delaying consideration of other approaches, like Universal CanadaCare. Every day that CMS can help delay and deny better thinking on the matter is another day of profit taking for Big Insura. Another bite at the apple. Another turn of the wheel. Let me see, 10B set aside with 5.6B obligated and the results is 380M – who – doesn’t love neoliberal maths [!!!!]. Oh yeah… patient and caregivers or the people such “study groups” are funded to provide greater market based efficiencies [tm] too. Damn you Lambert. Now others are going to wonder why I’m giggling under my full face environmental mask and Ebola suit all day, whilst stripping weather boards on a 100+ year old Queenslander renovation. Work space is less than 2m wide and about 25m long on a slope going down from the front of the house, say 3m in elevation. So no trestle and planks, have to use ladders w/ plank holders, single plank arrangement. Three elevation moves to do the side w/ three processes to finish striping and dressing for paint. Estimated 3 man days and done in 2 1/2 all at 55 years. Come join me Lambert, you can help me talk to the other tradies and clients about NC stuff, most know me as “the” A team or the enlightened painter…..
BTW those that favor fasting should try 8hrs in such an outfit, total detox by the end of it. The beauty of it is that there is always more funding for more tests and more fundraising when these policy “trials” fail to work (again and again) over the long haul. That is what they have been doing with school privatization for the last 30 years, or more — just give us 20 more years of testing, they say, and it will be sure to work — some time in the distant future, maybe a few centuries from now. Right. The veneer of empiricism is, in fact, a self-licking ice cream cone. Lest we forget Core was about privatization of not only education but knowlage itself and IP as it were. You could just as well have announced $100,000 prizes in the health care community for those that would come up with innovative ideas for the same purposes and it would have had a far better track record of success. No, this was all about a bunch of health policy wonks and consultants wanting the State, whom they hate so much, to pay them for the sort of lifestyle that most could only dream about and to keep their resumes looking good while trying to find ammunition for the marketeers to use in their fight against single-payer. So, if $5.6 billion out of an allocated $10 billion has been spent, the success rate is not the 2.4% as Lambert reports (2 out of 37 projects kinda, more-or-less successful) but instead 56% successfully completed. I think that the key sentence in this article was: “organizations attempt to reduce expenditures below a set target while maintaining high quality metrics in exchange for bearing risk for reducing expenditures.” Did you see that part that they slipped in? The CMS innovation center wouldn’t be liable for any risks involved but only those who adopted their ideas. Yep, that’s a neoliberal idea right there. They are never held responsible for the stuff that they do, no matter how catastrophic the consequences. Yes, that seems to be the difference between ACOs and HMOs — with ACOs, the providers are going to assume some risk. Neoliberal drunks are looking for their keys to health care under the lamp-post of the marketplace (“the streetlight effect“), and they’re not doing very well, are they? But please, research it for yourself. Thanks. As it happens I’ve worked closely with a team in Halifax for the last several years, and we’ve had a number of occasions to compare notes on health care. I’d trade my US health care experiences for theirs in a heartbeat. I’ve scanned the stories you link to and they reference a shortage of doctors in small communities in Cape Breton Island and other isolated, rural areas. I’ve been to Cape Breton and it is, quite literally, the end of the world – or at least the North American landmass. A beautiful place, to be sure, but it’s not exactly news that isolated communities struggle to attract professionals like doctors. Turning that fact into an indictment on the Canadian health care system is a big stretch. Compared to the United States, Canada does have great medical care. I’m sure that neoliberals are trying to destroy public health care in Canada, too, just as they are in the UK (although the rot is further along in the UK). One reason this is an international fight. 1) a cousin was feeling poorly, went to his doctor, who sent him immediately for a stress test with a cardiologist, who then immediately referred him to a surgeon, who installed a stent in his 90%+ blocked main heart artery. Total elapsed time – three days. 2) my sister collapsed outside the restaurant after a rich meal, went to the emergency room, where she was diagnosed with gall bladder stones. Three days later she was recuperating from gall bladder removal surgery. 3) an elderly relative had a hernia – referred to a surgeon, for whom she had to wait six weeks for an appointment. He then scheduled her for surgery – three months later. Non-emergency, yes a delay. 4) an elderly friend needs a hip replacement. The earliest he could get a surgery appointment was four months out. Again, non-emergency. In all cases, no bills, no copays, no futzing around with insurance company denials of payment or short-payments, no doctor’s office staff time spent in dealing with billing the insurance company, arguing with them, etc. etc. And no $14 million fat cat insurance company CEO parasites. Americans should get out more and see how much better the Canadian system is. It is not without flaws, but the US system to me seems a profiteering mess of perverse incentives. And Obamacare baked in all the inefficiency and profiteering – because why? It was designed of by and for the health care and pharmaceutical cartels, who controlled the process through their ownership of the Democratic Party. SO corrupt, so criminal, so evil. Thanks to Lambert for this post. I am especially grateful for the reference to the Mirowski essay. Among other strengths it provides a clear and concise discussion of the differences between neoclassical economics and neoliberalism. I like the historical background on the “thought collective” very much. My post on the same topic is designed to allow you to detect a neoliberal easily and quickly in conversation, but Mirowski’s article is a real work of intellectual history. This debate will go nowhere until the simple question is driven home again and again. Should healthcare be treated as a for profit endeavor? It is a yes or no answer. Then the political camps can be formed and the battles waged- and won. Neoliberalism thrives by fighting never ending battles. By making the debate center around profits and payment, at the very least, the process can be drawn out indefinitely. All the while, the quality of care decreases and more people die. Health deteriorates just from the stress of having to deal with the uncertainty. People must get their minds wrapped around the idea that not everything has to be done for profit. Only then can concrete demands be made and acted upon. Thanks for the Mirowski link – one of my favorite authors. Just trying to adjust the financial flows is another example of financialization within a capitalist casino structure. As “Skippy” commented, I love the math 5.6 billion spent and 380M saved. Now that’s entertainment. Glad you circled this to neoliberal ideology. I attend many a Medicare forum in DC. There is an obsession with solving all of our health care problems by getting to the right “price.” You see this is in MACRA, Managed Care, you name it. All of these discussions over look the simple fact that price is not a substitute for regulation, auditing, ect. They believe a magic formula can be found to get rid of all moral hazards (i.e. FFS incentivizing over-utilization or capitation leading to bad care instead more efficient use of resources) and deliver quality and improve outcomes. The political problems of health care aren’t solved (at least not in this country) so the economic solutions are a nonsense. I was perhaps too gentle on this post. One would expect, if the neoliberal perception of/assumptions about the health care system were correct, that there would be an enormous amount of “low hanging fruit” simply waiting for market-based solutions. So, the “Innovation” Center is given an enormous budget with virtually no constraints, and told to go pluck that fruit. They pick 37 varieties of low-hanging fruit, and all but two are inedible. So perhaps all the assumptions are wrong and the entire enterprise is a crack and a scam. Certainly that is the most parsimonious explanation for the failure. Adding, insoluble problems are a fertile field for self-licking ice cream cones. Hence your DC discussion. Making operational changes will be viable and attractive only if new APMs and payment reforms are broadly adopted by a critical mass of payers. When health care providers encounter new payment strategies for one payer but not others, the incentive to change is weak. When payers align their efforts, the incentive to change is stronger, and the obstacles to change are reduced. This makes it sound like a cover for collusion between independent insurers to force providers to accept their models.